Stuart Hogg is fit to start for Scotland against Fiji and joins Greig Laidlaw among nine changes to the team that lost to Wales. 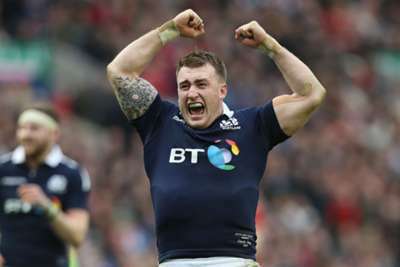 Scotland named an experienced yet weakened team in Cardiff after a number of injuries, but one such issue has been resolved with Hogg's return to fitness. The Glasgow Warriors full-back had ankle surgery just eight weeks ago, but he lines up as vice-captain at number 15. Laidlaw will skipper the side on Saturday, with Stuart McInally - last week's captain - dropped to the bench, while Finn Russell also comes into the XV at fly-half. Exeter Chiefs lock Sam Skinner, a former England youth international, has been handed his debut, with several other changes seeing men who impressed as replacements against Wales rewarded. Fraser Brown, Grant Gilchrist, Matt Fagerson and Pete Horne are all in, but Gregor Townsend is confident there remains enough knowhow in the side to defeat Fiji. "It's a more experienced side this week in terms of time together at this level, while we've rewarded some of those who performed well off the bench with the chance to start," Townsend said. Scotland XV to play Fiji: Stuart Hogg, Tommy Seymour, Alex Dunbar, Pete Horne, Sean Maitland, Finn Russell, Greig Laidlaw; Allan Dell, Fraser Brown, Willem Nel, Sam Skinner, Grant Gilchrist, Ryan Wilson, Jamie Ritchie, Matt Fagerson. Replacements: Stuart McInally, Alex Allan, Simon Berghan, Jonny Gray, Josh Strauss, George Horne, Adam Hastings, Chris Harris.